THOUSAND OAKS, Calif. — At least 11 bar patrons and a sheriff’s deputy were killed late Wednesday in a shooting at a country and western dance hall in Thousand Oaks that was holding an event for college students, officials said. 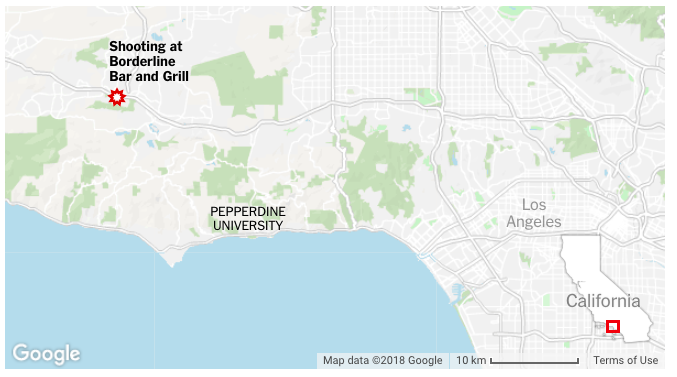 The gunman is dead, officials said early Thursday, adding that there was no longer a threat to those at the bar, the Borderline Bar & Grill, which had been filled with about 100 people at the time of the attack. Witnesses described a chaotic scene: A gunman opening fire, first at a security guard, as patrons dropped to the dance floor, hid under tables and broke windows to escape. The Ventura County sheriff, Geoff Dean, said there were “multiple other victims of different levels of injuries.” His voice cracking, he identified one of the dead as Sgt. Ron Helus, who was shot when he entered the building. She said she saw him quickly reload his gun and fire again. “People started running to the back door,” she said, and she heard someone shout, “Get out — he’s coming.” She then fled the venue and heard another burst of gunfire.